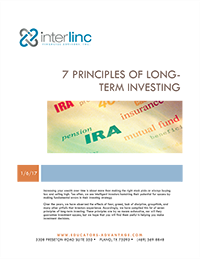 The Interlinc Difference | Interlinc Financial Advisors, Inc.
Interlinc is an independent firm and doesn’t have the corporate sales quotas or proprietary products found elsewhere. Working together, we can focus entirely on your needs. As fiduciaries, every choice we make must reflect your best interests and connect to your plan. We would always choose to act in this manner, but we find that our legal responsibility helps new clients find even greater confidence that we are always on your side. Before we begin to customize your strategies, we get to know you and your family as individuals - uncovering the priorities, circumstances, and concerns that fill your financial life. By taking an educational approach to our relationship, we help ensure you have the guidance you need to protect your well-being. Once we understand exactly where you are - and what you hope to accomplish - we can design a plan for your future. We then uphold your plan with ongoing strategic and technical analysis so you can support the lifestyle and legacy you desire. From creating sustainable income strategies to reducing your tax liabilities, a wealth-preservation mindset grounds your plan. Because the financial world and our clients' lives are constantly changing, we build your map to adapt through fluctuations. We believe you deserve access to the best opportunities in the marketplace. We've developed relationships with hundreds of investment and insurance companies in order to offer a full spectrum of support. When tailoring each plan, we find the opportunities that truly fit your needs - including institutional investments rarely open to individuals. Through our comprehensive support, we will address the many facets of your financial life with forethought and care.